Heartburn is the most annoying of all symptoms of acid reflux. It causes aches and pains reaching from your chest to your throat. Chest pain can burn constantly or come and go with painful burps. Symptoms can last for several hours after eating. Be sure to exclude heart pathology if you have chest pain. Heartburn comes typically after meals and responds quickly to antacids. Symptoms of acid reflux can worsen dramatically during the night. Nighttime acid reflux disturbs your sleep and makes you feel exhausted during the day. I have always had digestion difficulties. As much as I love spaghetti, pizza or french fries, I try to avoid them because I know they give me symptoms of acid reflux . Because my spaghetti keeps on coming back hours after I've had it, I used to think that my stomach was 'lazy' and simply needed more time to digest than with somebody else. Now I know that this impression of a 'lazy stomach' is not correct. Every stomach needs several hours to digest food. Depending what and how much you eat, it takes four to eight hours to digest a meal. The difference between having acid reflux and being able to devour whatever you want, is made by your stomach's valve. If it is able to seal off your stomach completely, your digestion can perform its job without you being aware of it. If you have a weak stomach valve, like mine, you have symptoms of acid reflux during the entire period of digestion. Acid Reflux And Back Pain? Let's be clear about this one. Acid reflux does not cause back pain. However, evidence shows a correlation between people suffering from lower back pain and people having symptoms acid reflux. Eighty percent of Western people have an episode of low back pain at least once in their lifetime. Sixty percent of Western people suffers from acid reflux. That means that chances are high that you suffer from both conditions at the same time. Some risk factors for developing low back pain apply also for acid reflux. Unhealthy habits like smoking, stress, lack of movement, obesity are all risk factors resulting in low back pain as well as acid reflux. Research has shown an association between acid reflux and having a bad breath. The link seems to be a specific bacteria, called 'Helicobacter Pylori'. This type of bacteria is naturally present in your stomach. If you have acid reflux, it travels along with escaped stomach acid towards your throat. Once arrived inside your mouth cavity, the escaped stomach content meets your tongue. The irregular surface at the back of your tongue forms the ideal playground for bacteria to grow. Microorganisms ,such as H Pylori bacteria, feed themselves with food debris and are able to multiply rapidly. They produce a bad smelling gas, called hydrogen sulphide. Every time you breathe out, the sulphide smell is blown out of your mouth. Upward traveling stomach content exposes your airways to gastric juices. The acidic content can irritate the respiratory system and cause asthma and chronic sinusitis. Acid reflux causing upper airway problems is called “laryngopharyngeal reflux (LPR)” or “atypical reflux”. Acid Reflux Symptoms Without Knowing? Some people suffer from acid reflux without ever experiencing heartburn. This type of reflux can remain unnoticed for a long time and is therefore called 'silent acid reflux'. People with silent acid reflux can walk around with a variety of acid reflux symptoms like indigestion, nausea, sore throat, hoarseness, wheezing, a bad taste in the morning or nasal dripping. Because the obvious sign of heartburn is not present, they don't realize that acid reflux is the main culprit. Another sign of acid reflux without the painful heartburn, is a lump-like feeling at the back of your throat. It feels as if your stomach is literally 'filled' up' to your throat. 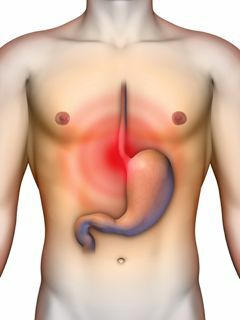 People with silent acid reflux perceive an irritation of the esophagus as a lump feeling instead of a painful heartburn. It is only after a few years, when stomach ulcers or Barrett's Esophagus is seen during a gastroscopy, that the link with acid reflux is laid. Silent acid reflux in babies is something completely different. In babies, the term 'silent reflux' indicates that the reflux remains unnoticed by the parents. Silent reflux babies don't spit up and therefore hide the cause of their crying. Patients with acid reflux symptoms, should realize that their condition shouldn't be left untreated. Acid reflux symptoms increase the risk of developing esophageal cancer and Barrett's syndrome. It is important to know that a wide variety of heartburn remedies exists and that a lot can change with an acid reflux diet. That means less coffee, tea, chocolate and less alcohol, cigarettes and loosing weight. Patients with persisting problems should seek medical help.